I can’t believe Valentine’s Day is this weekend! Here’s some outfit inspiration for a romantic date night! Do you have fun plans? Such pretty picks. Love the red lace skirt! Love that red lace skirt! Great picks! Beautiful skirt! Perfect for date night. I LOVE that red lace skirt. So beautiful! This outfit looks perfect for any date night, but especially love day. Loving this Valentines Day look!! Love that skirt on repeat!! Such a timeless look. Love that red skirt! So fun for Vday. super cute! Thanks for sharing!! Hope you have a great day!! Much love! 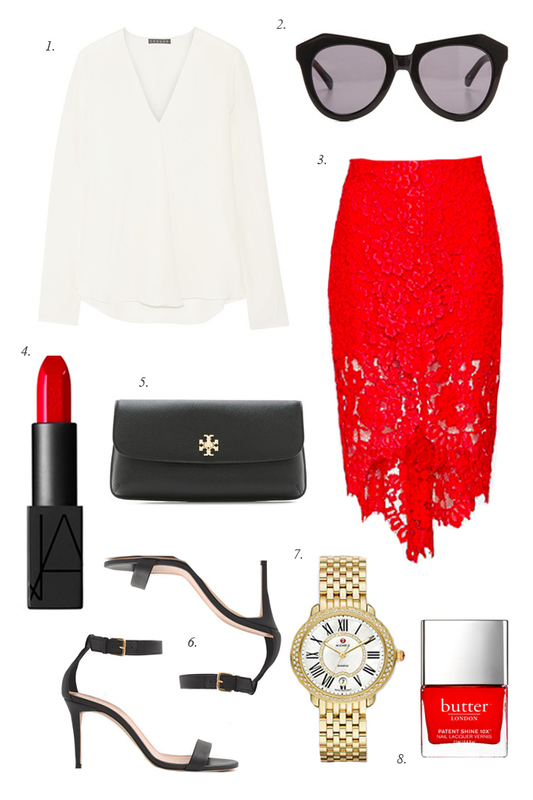 Love the lace skirt it’s perfect for Valentine’s Day! That red skirt is gorgeous! I love the lace. I love those JCRew heels!! I need this skirt! Now! Gorgeous outfit, that skirt is stunning! I die over that skirt! That red skirt! I seriously need it!! Valentine’s day is sunday this year so I think we are going to do a family date doing something outside. I love skirts like this! They are so adorable, love your picks! That red lace skirt is gorgeous, thanks for sharing! That skirt and watch! Gorge! I am so obsessed with that skirt! Love it. ooooh I LOVE that skirt! Perfect collection for a valentine date evening. Such a gorgeous red skirt! Great picks.